When I sold my small business in 2015, I promised myself that I would see more of the world. 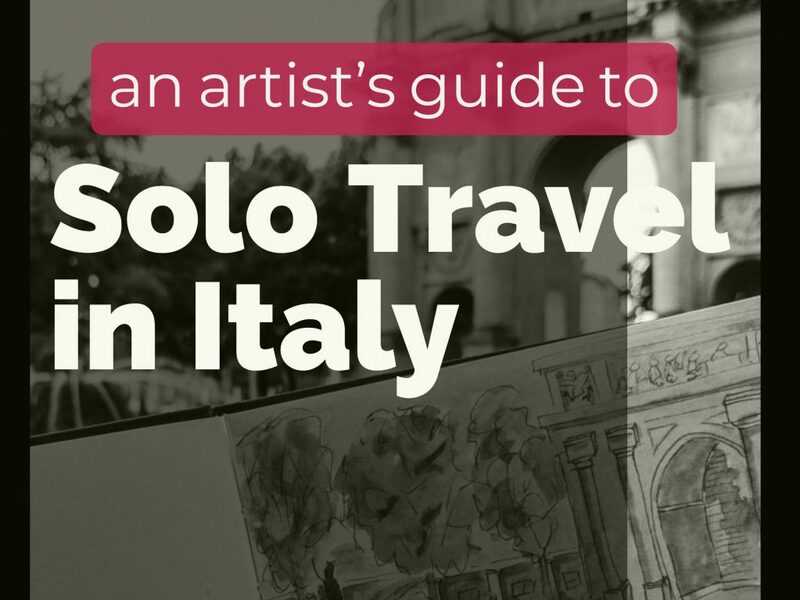 Initially, I was turned off to the idea of solo travel, so I put my travel plans to the side. That was two years ago. In the time since, I’ve grown in my ability to navigate unfamiliar spaces and, through following a few solo travel blogs, warmed to the idea of solo travel. In April of 2017, I began planning my first solo journey- 25 days that summer in Italy, Croatia, and Bosnia. 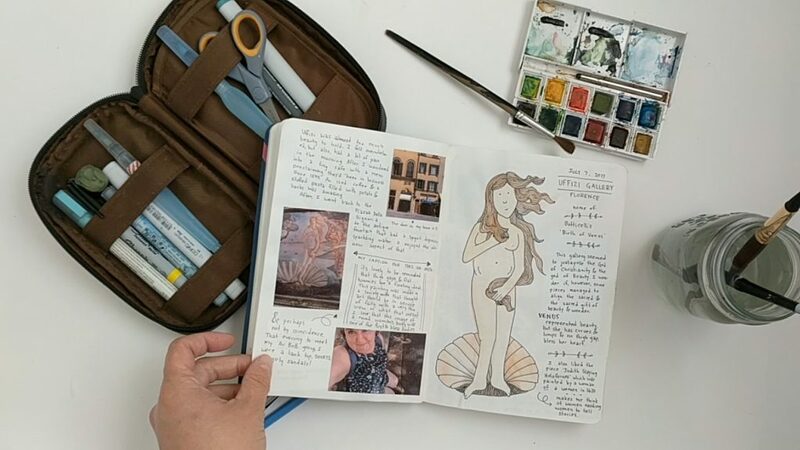 At some point, as I dreamed about travel and adventures, I began to imagine what it might be like to honor my artist self with something that all classically trained artists receive- a chance to study the masters. I dreamed, cautiously, of spending hours in museums during my trip, sitting in front of the iconic work of the masters and translating their work into my style. I did this with caution because, as anyone can tell, I’m not a classical artist. Realism in art defies me, and I was acutely aware of the exposure that sketching in a museum carries. Could I bring the courage I’d need to sit in some of the best museums in the world, before works of the masters, and doodle? 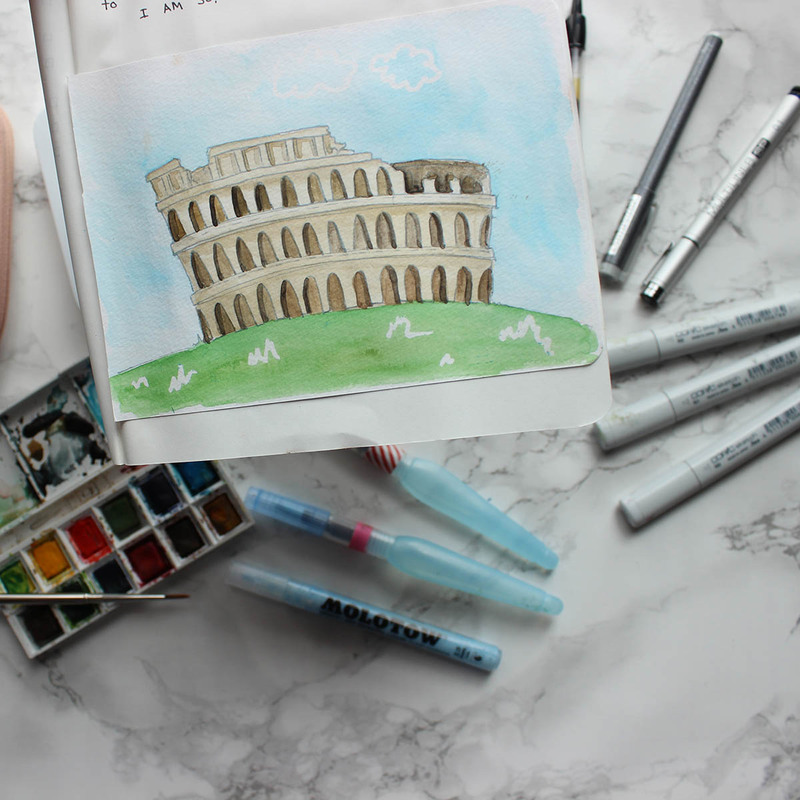 Cautiously, I packed my bags, created a travel art kit, and set off on my journey. I intentionally planned my days without an itinerary, so I had the freedom to wander, to bask, or to explore. On my first full day of my trip, I was in Florence, and the only thing on my to-do list was to make it to the Academia Gallery by days end. 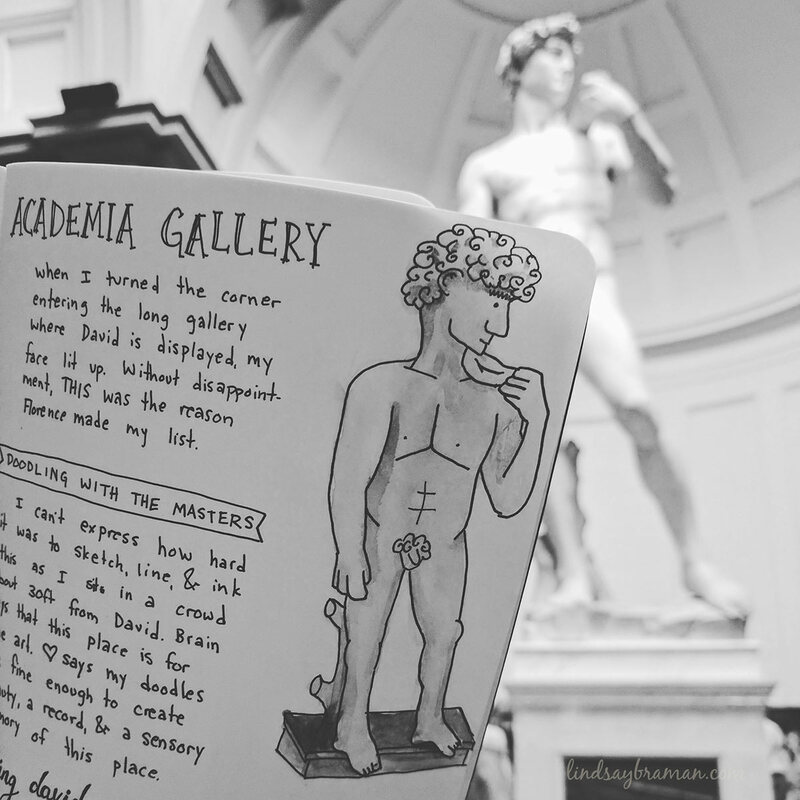 Academia was built specifically to house their most famous piece- Michelangelo’s David sculpture. It was at this gallery that I discovered the best part about solo travel as an artist- the freedom to really pause and take in great art. Without having to be sensitive to a partners interest or boredom, I could sit for hours with David- and I did. After some study and some people watching I went to work on this little doodle. 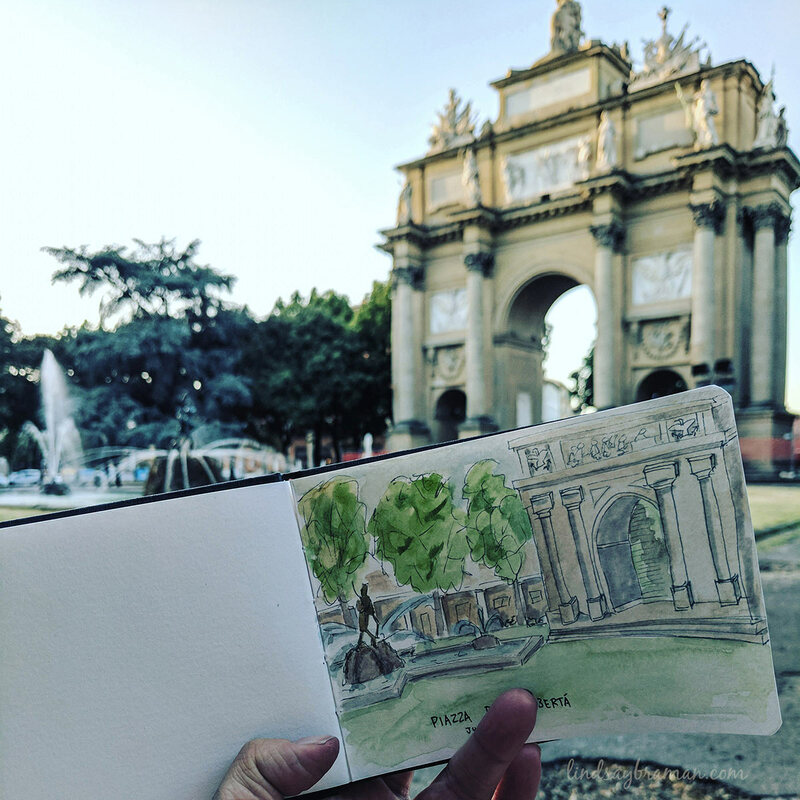 Cruelly, Uffizi did not provide benches with a view of this piece, but I was able to stand with it for a time, studying, and then snap a photo to sketch her from a bench in a nearby hallway. Botticelli’s The Birth of Venus. It is lovely to be reminded that thigh gaps and flat tummies are a fleeting ideal. This painting was made in a society that thought art should be in service of faith with a very narrow view of what that meant. I love that this image of a round woman’s body was one of the first to say the beauty of bodies, God’s creation is good. On Day 3 I strayed a bit from my “no itinerary” plans and booked an: Air BnB Experience. In a brilliant move on AirBnB’s part, in my opinion, they are using their network of local hosts as a source from which to curate local guides. Only available in limited cities at the time of this writing, AirBnB made booking the tour really easy (since I already had an account) and I loved, love, loved that it really was the offer of a memorable “experience” instead of an information-based tour. Of the three day tours I joined during my 3 week journey, the AirBnB experience was my favorite. I didn’t actually get the chance to doodle this one until I was in Croatia, and it’s not one of my favorite travel doodles- but it captures the experience- and that’s what my travel art journal was all about. The journal gave me space to capture what stood out about the experience- the texture of a truffle, our guide and his dog, and the views as we hiked through the Tuscan hills overlooking Florence. 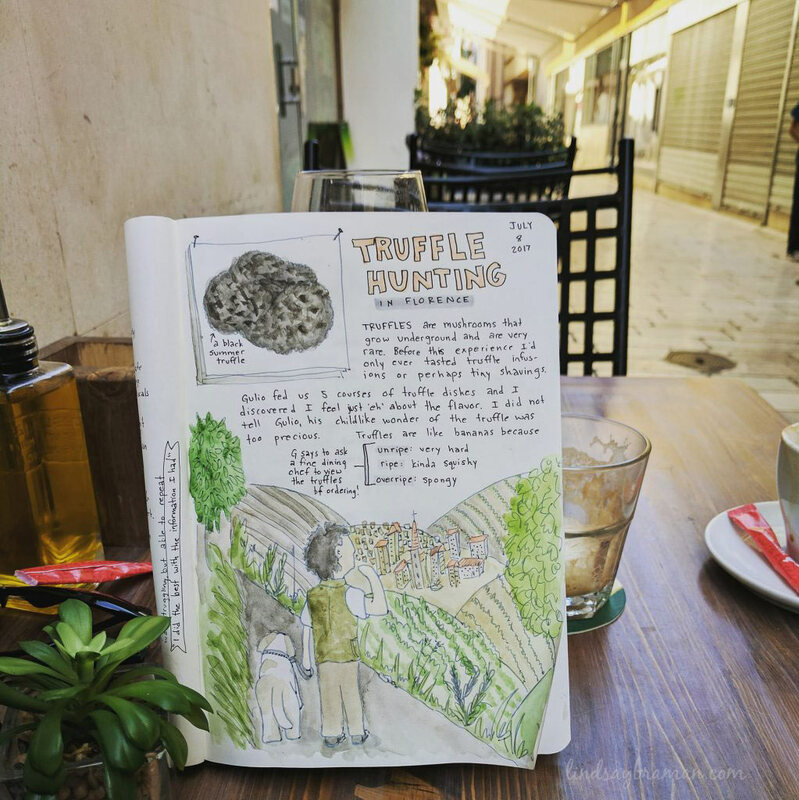 Space left for text allowed me to record a few things I learned about truffles. You can read more about my adventure truffle hunting in Italy on my other blog. 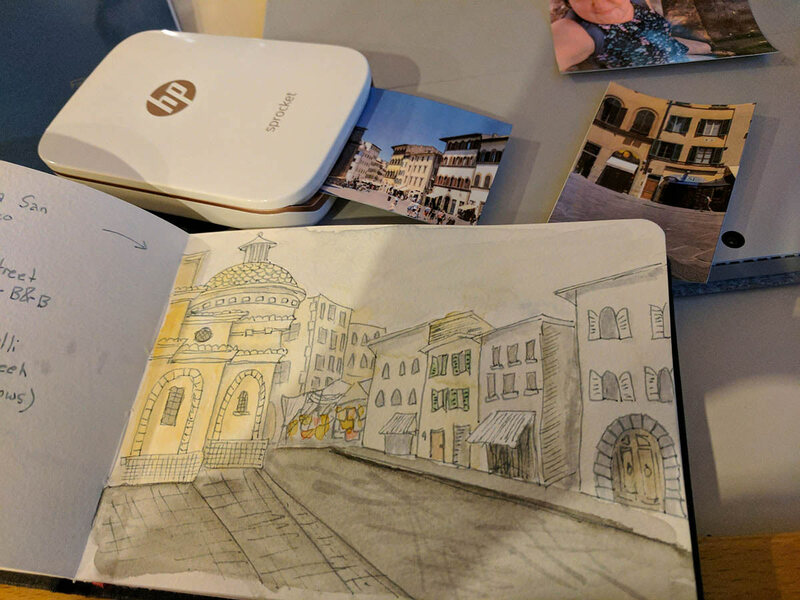 Florence was my first opportunity to use my doodling to collect a record of the places I visited, not just the art I saw, through recording streets and buildings. Architecture is a point of interest for anyone visiting Italy, and the not-very-popular but still beautiful Piazza Del Liberta was a great spot to sit in the cool of the evening and practice architectural doodles. This turned out to be the first ofmany architectural doodles during the trip, but it’s still one of my favorite. I kept a separate hardcover booklet of heavy watercolor paper in my pack for these kind of watercolors. My trip began and ended in Italy, with two weeks of exploring Croatia and Bosnia in the middle. 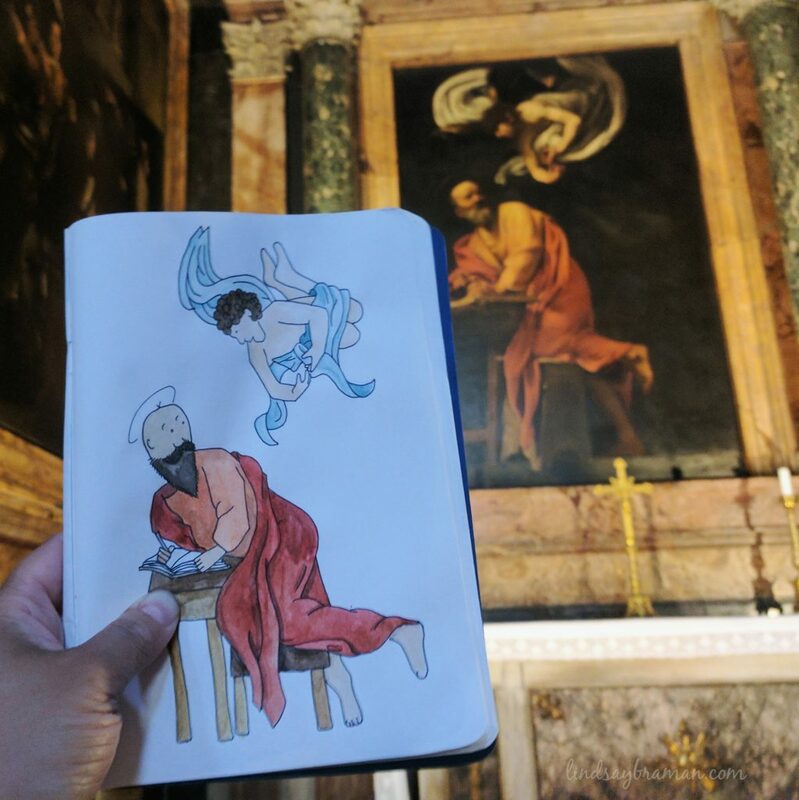 On the return trip to Italy, I spent four days in Rome. 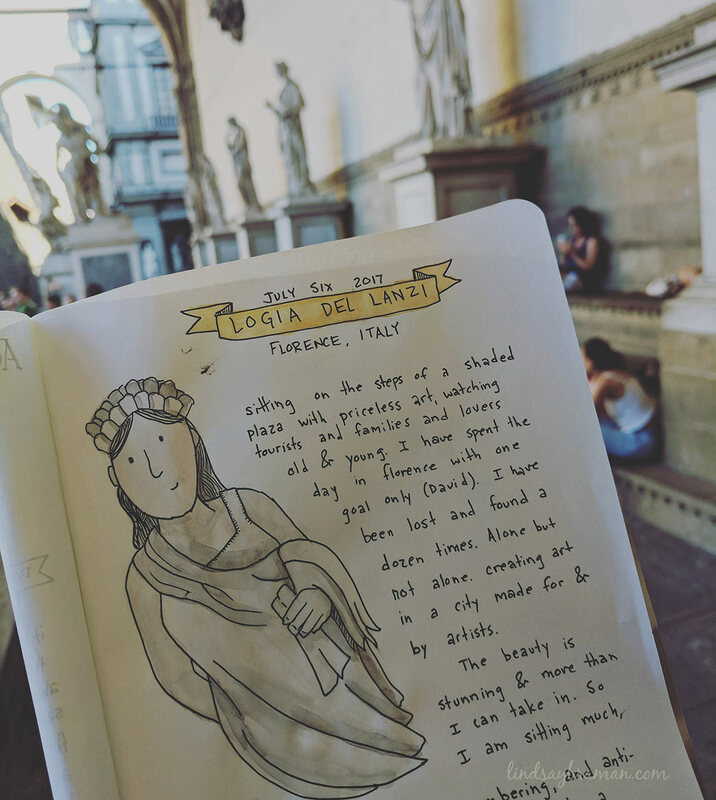 By the time I reached Rome I was so tired, but the doodles I made time for were lovely ways to rememeber what I saw during my solo time in Italy. In Rome more so than Florence, it was the architecture rather than the galleries that demanded most of my awe. so lovely to see them all collated 🙂 . any chance you might share your info/discoveries/ sources on single person travel? Thanks for your comment! 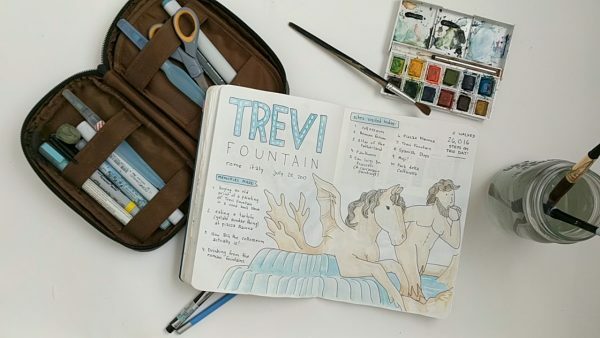 This is my art blog and I have a blog about non-art stuff, like solo travel, over at hawk-hill.com I’ve written about some of my adventures traveling as a single person there!